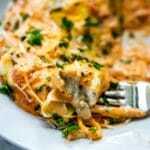 If you are looking for a crave-worthy low carb meal, this Zucchini Ravioli Recipe with Chicken fits the bill! It is a healthier twist on a classing you love. 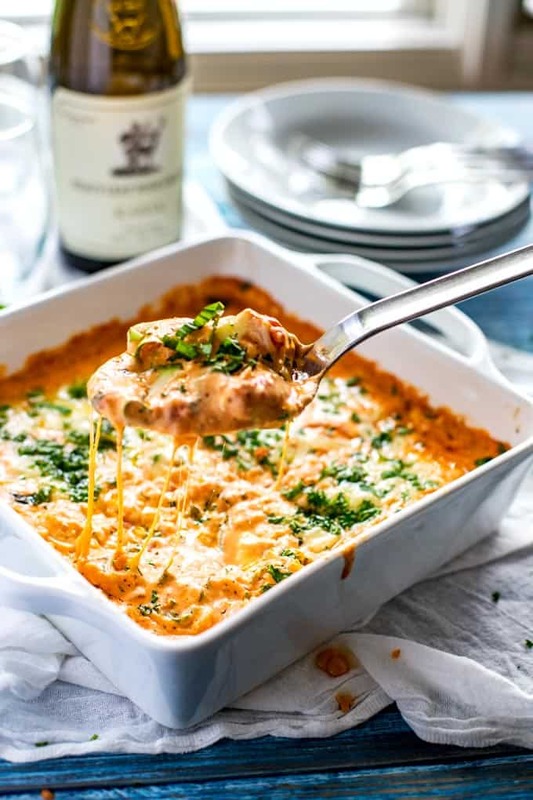 Cheesy, creamy and flavor-packed – you will never miss the carbs with these keto friendly recipe! 5.1 Do You Need Special Equipment to Make Zucchini Ravioli? 5.2 Can Zucchini Ravioli Be Make Ahead? I fell in love with Ravioli the first time I ever had it. I am not sure what the occasion was. Most likely my parents were going out, and my Mom needed something easy that the babysitter could make for dinner. So in typical 70’s fashion, she bought canned Ravioli. As a child that grew up on boxed Macaroni and Cheese, it didn’t cross my mind that they were highly processed and probably not the best thing for me. All I knew was that I loved Ravioli. They became my favorite go-to meal for lunches, when my parents went out, and pretty much any time I could talk my mom into letting me have them. I gave up canned ravioli at some point during my adolescence, but never forgot how much I loved them. These days, I am obsessed with these Zucchini Ravioli. I will be honest when I first saw and was introduced to the idea of Zucchini Ravioli, I was skeptical. I decided to give it a try , and I am so glad I did. Guys…this is SO good. 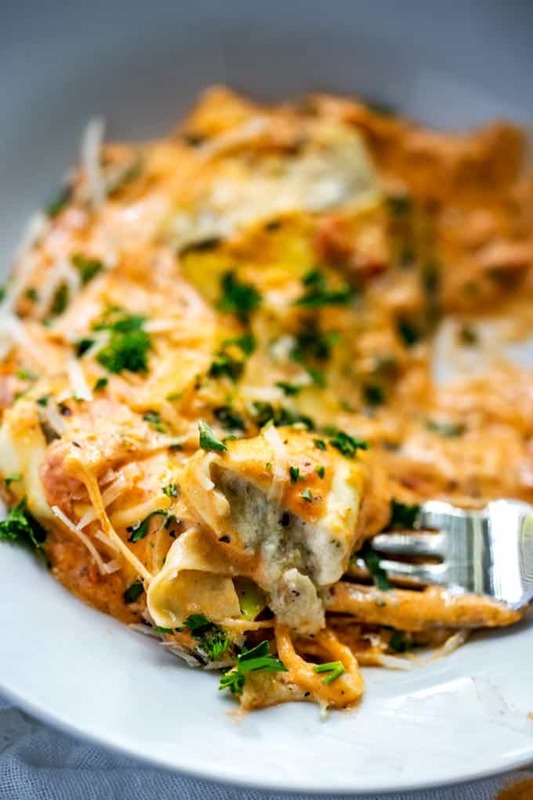 Rich, creamy and totally indulgent, this Ravioli is special enough for date night. I am not sure why I was so surprised. I already knew that zucchini, like cauliflower, is one of the most versatile veggies around. Just look at these pizza bites and tortillas. 1. Gather all of your ingredients. 3. 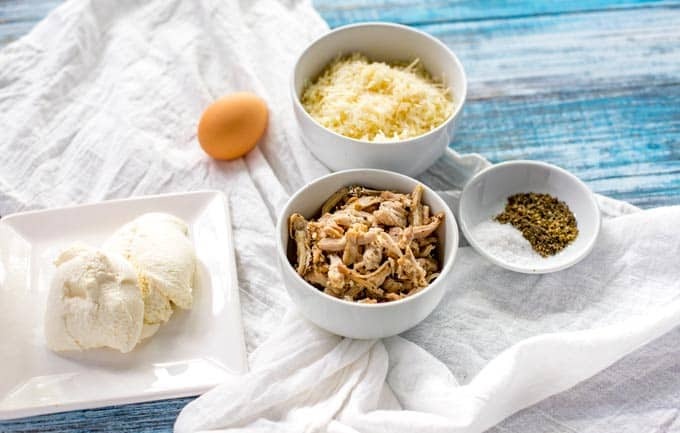 Make the filling by combining chicken, ricotta, Parmesan, egg, Italian season, salt, and pepper in a medium bowl. Stir until blended. 6. Lay two strips side by side, so that they overlap lengthwise. 7. Do the same thing with two more noodles on top, perpendicular to the first strips. 8. Add about a tablespoon of filling to the center of the zucchini. 9. Working one side at a time, bring the ends of the strips together to fold over the center. 10. Place the ravioli seam side down in a baking dish. 11. Pour sauce over the top. 12. Top with Gruyere cheese. Instead of using the ricotta mixture, try using pesto for the filling. Sun-dried tomato pesto is especially delicious! 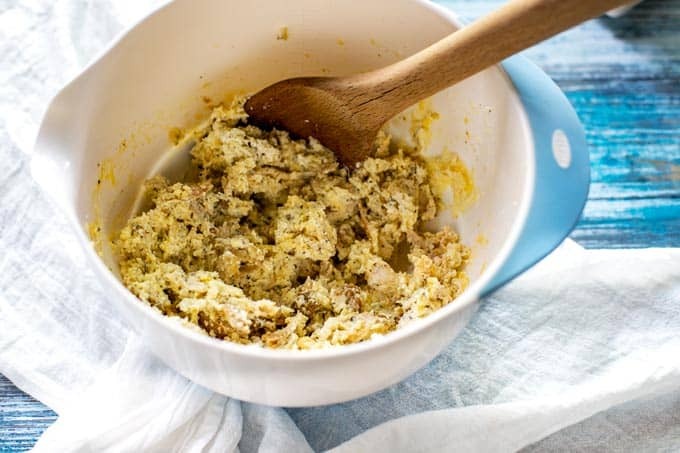 For an extra kick, add a tablespoon of minced garlic (to taste) and 1/2 teaspoon crushed red pepper to the ricotta mixture. Top with marinara in place of the Creamy Tomato Sauce. Make vegetarian by omitting the chicken. Do You Need Special Equipment to Make Zucchini Ravioli? Can Zucchini Ravioli Be Make Ahead? Yes, Zucchini Ravioli can be made up to one day ahead and then baked just before cooking. You can reheat leftovers in the oven or microwave. 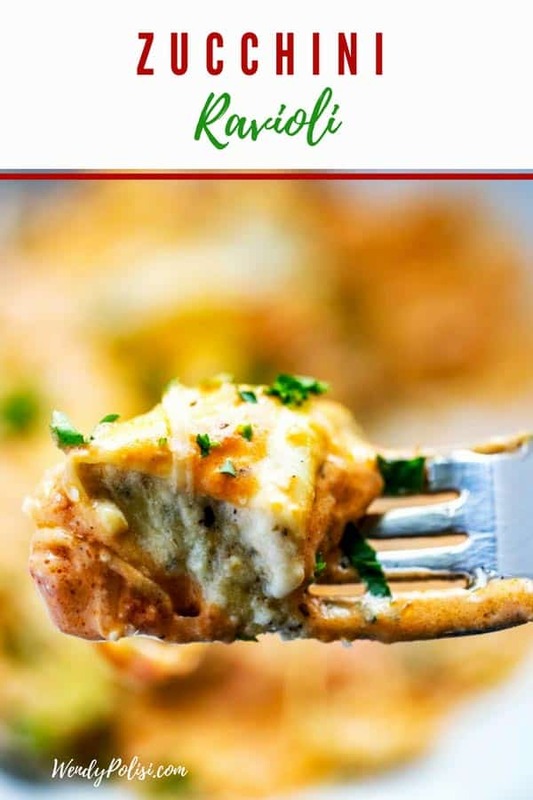 If you are looking for a low carb casserole that will make you forget all about carbs, give this Zucchini Ravioli a try! 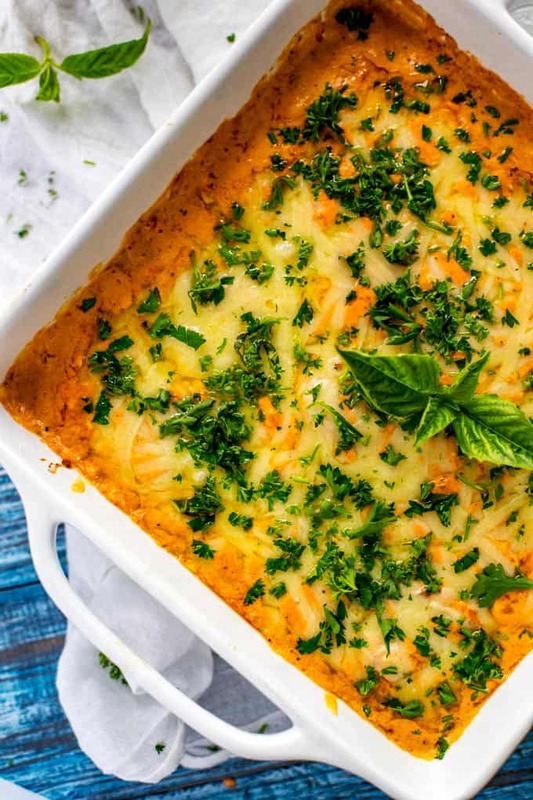 Rich, creamy and oh so cheesy, this recipe is perfect for a special weekend meal. Preheat oven to 400 degrees. Spray a medium baking dish with avocado oil. 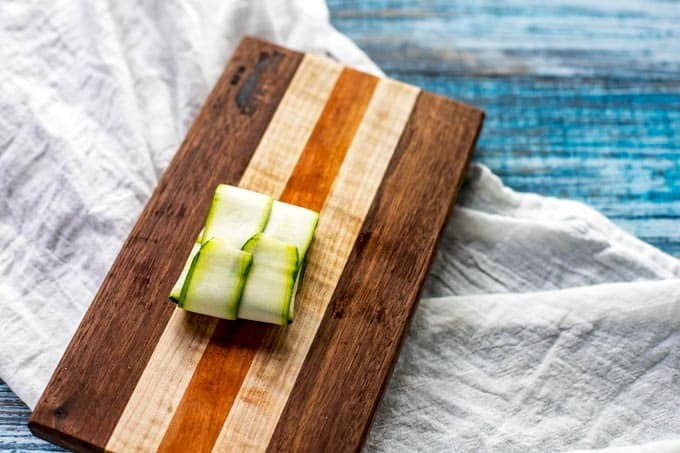 To make the “noodles,” slice two sides of the zucchini lengthwise, creating flat sides. 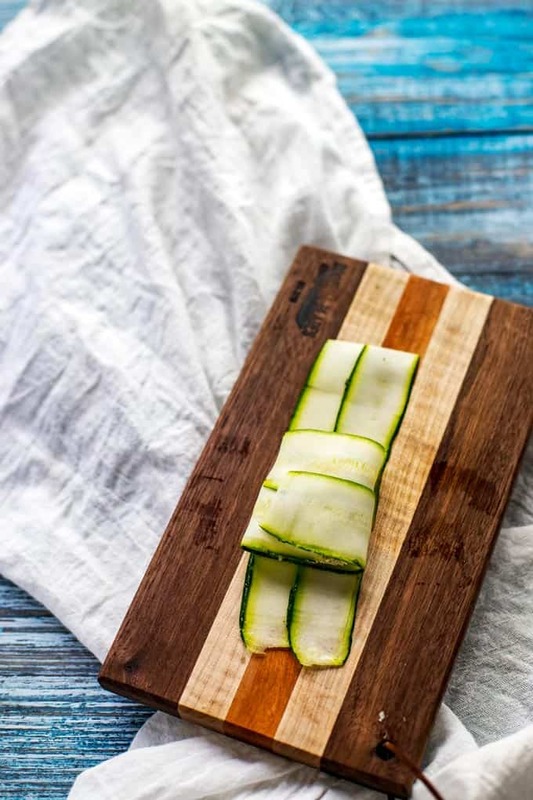 Use a vegetable peeler to slice each zucchini into flat strips. Lay two strips of zucchini noodles side by side, so that they overlap lengthwise. Do the same with two more noodles on top, perpendicular to the first strips. Add about a tablespoon of filling to the center of the zucchini. Working one side at a time, bring the ends of the strips together to fold over the center. Turn the ravioli over and place in a baking dish seam-side down. Pour sauce over ravioli and top with Gruyere cheese. Bake for 20 minutes. If you’ve tried this Zucchini Ravioli or any other recipe on the blog then don’t forget to rate the recipe and let me know how it went in the below comments, I love hearing from you! You can also FOLLOW ME on FACEBOOK, TWITTER, INSTAGRAM, and PINTEREST to see all my recipes. That looks really good! I’ve never had zucchini ravioli before. I love zucchini, though. I’ll have to try this. This looks delicious! We have swapped out pasta for zucchini in a lot of recipes but I haven’t tried it as ravioli yet. Sounds delicious! I love zucchini and ravioli, and this seems like a perfect combination. I’ll definitely be trying out your recipe especially when zucchini is abundant at the end of the summer! I love, love, love ravioli. This is such an interesting alternative. I bet it is amazing. Wow! It looks very yummy and delicious. Especially the creamier look of it. I would definitely try this at home. 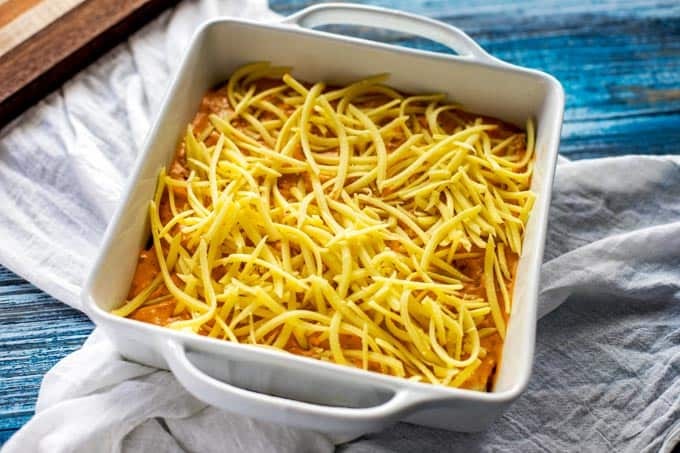 This recipe looks so delicious and healthy I will definitely try to make this on this weekend and I am sure my guest will like it. Thanks for sharing this great recipe. I am salivating in hunger. Everything about this is totally my jam and I would love to feed it to my son to sneak in some veggies! Wow this looks so good! My husband just decided to try gluten free. I bet he would love zucchini ravioli! This is great! Low carb is a plus. And I bet I could remove the chicken and add more veggies to make it vegetarian for my daughter. LOVE IT! Oh yum, this looks so dang good! 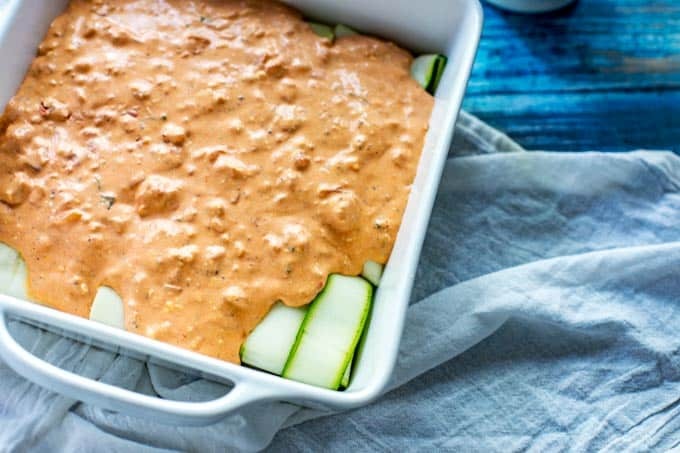 I’m totally going to have to try this, I love anything zucchini. Now that is my kind of dish. 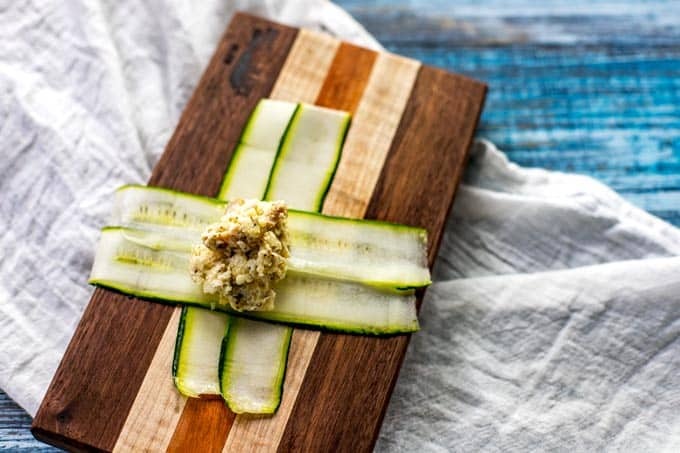 I love zucchini, but I have never tried preparing it like this. Certainly going to make this. Thank you for the recipe. Tried this for the first time today and it was amazing!!! I added ground beef to it instead of the chicken and my non zucchini loving husband even said “I could make this meal again!” That’s a win! So glad that you enjoyed it Liz! It is a favorite around our house too!